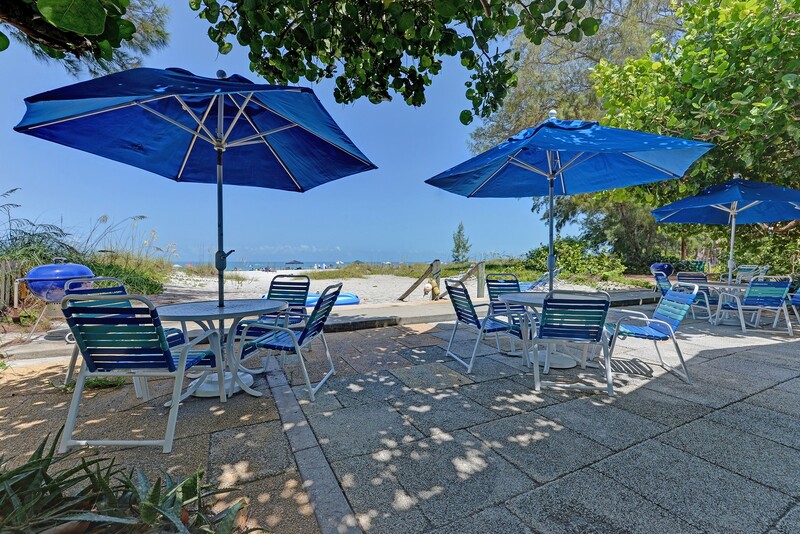 Come and relax at the Sailfish Beach Resort on the sugar white beaches of Anna Maria Island! This unique, laid back, Old Florida style accommodation guarantees a memorable beach vacation! 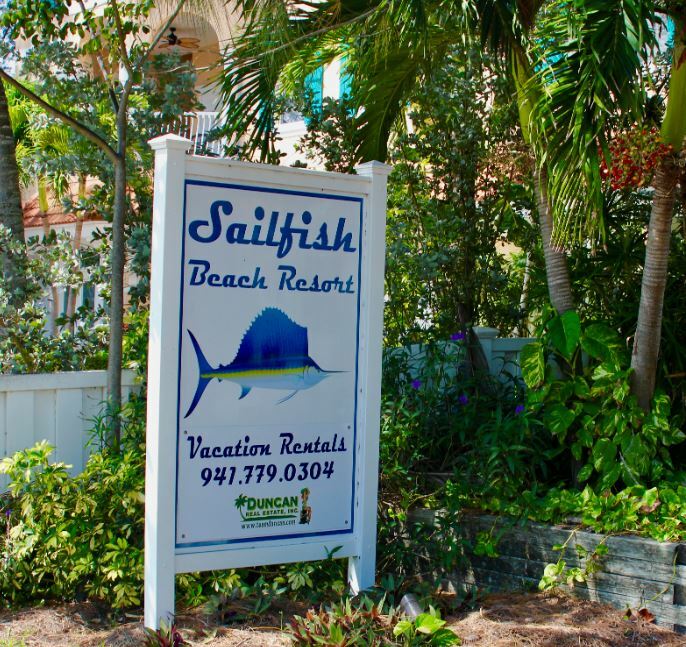 Sailfish Beach Resort is a fantastic ground level Gulf front paradise. There are 4 units in total with two suites directly on the Gulf of Mexico with water views and two suites in the back with garden views. All feature 1 king bedroom and 1 tub/shower bathroom and a fully equipped kitchen that sleep 4 in total. There is a shared laundry on site and and outdoor shower to rinse off the sand and saltwater. The entire front of the complex that faces the beach offers a large shared patio with plenty of seating. There are tables with umbrellas and a charcoal grill for that fresh fish dinner! Enjoy island breezes, views of the dunes and the spectacular turquoise waters. Step out and onto the beautiful powdery beaches–it simply doesn’t get better than this. There are also sun loungers for your relaxation nestled in the private sand area. Being Gulf front means spectacular sunsets night after night. Enjoy picturesque skies right from the comfort of the living room in the front units or just get comfortable on the patio for an unforgettable display of nature. Retreat to your quarters knowing you can have your feet right back in the sand the next morning. 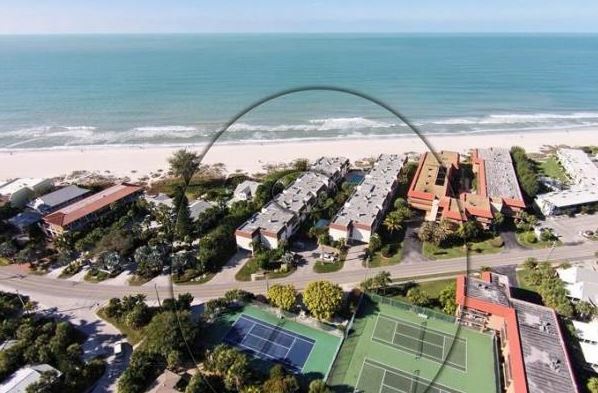 The location of the Sailfish Beach Resorts in Holmes Beach puts you right in the heart of the island, not only are you directly on the Gulf beaches but just a short walk away from all the best amenities the island has to offer. Explore the island on your own or simply take the free trolley to get hassle free to all island places. Shopping, restaurants and a free trolley are within 2 blocks from this convenient spot on Anna Maria Island. The island’s only full service grocery store “Publix” is conveniently located in walking distance as are The Anna Maria Island Shops along East Bay Drive. They offer a wide variety with small eateries, souvenir shops, pharmacies and a mail store. The close by Manatee Public beach features a lifeguard tower, an on-site concession, showers, playground and volleyball courts. Friends and family will enjoy the proximate to all these facilities. 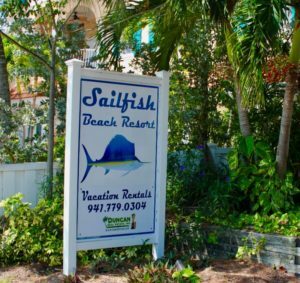 Sailfish Beach Resort is the perfect vintage feel Florida retreat with all the modern amenities if you are traveling as a couple or a family with children. Rent one or all 4 units for a larger group with up to 16 people. Take advantage of the current introductory rates as they will not last long! Some renovations are coming September/October 2019. 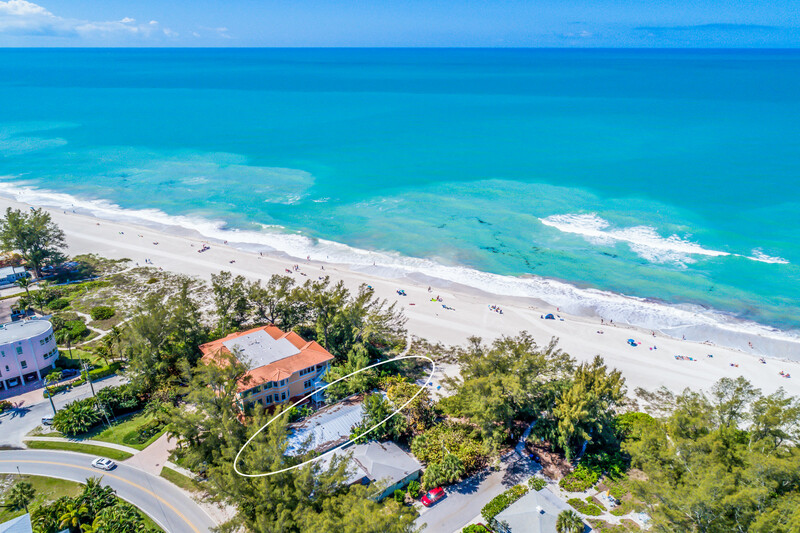 If you need more information on this fantastic Gulf front Duncan vacation rental on Anna Maria Island or other beach front and water view properties in our rental program please contact Team Duncan. You can contact us at 941 779 0304 or send us a quick message. The premier fashion show “Passion for Fashion” on April 11, 2019 was a successful event at the Center of Anna Maria Island. 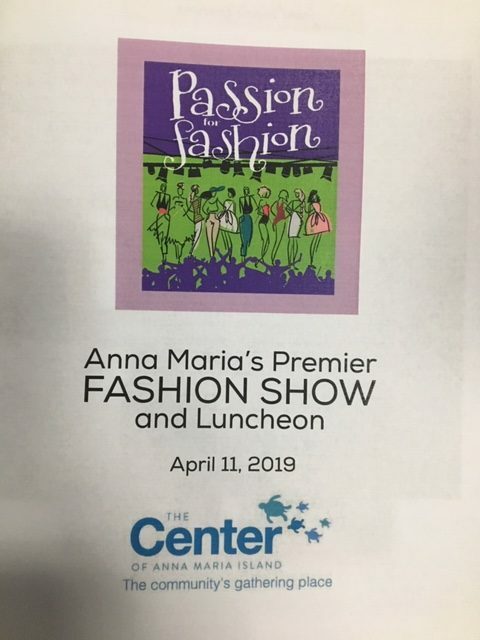 This first showcase of spring and summer styles from the local boutiques on Pine Avenue is a fundraiser for the center’s programs that will receive all the proceeds. Tickets were $40 to participate to support this important part of our community that serves so many. The event featured an elegant luncheon, a silent auction, honoring of local businessmen Ed Chiles and Mike Thrasher and the guest speaker Barbara Zdravecky that gave a talk about her passion for women in business and female empowerment. 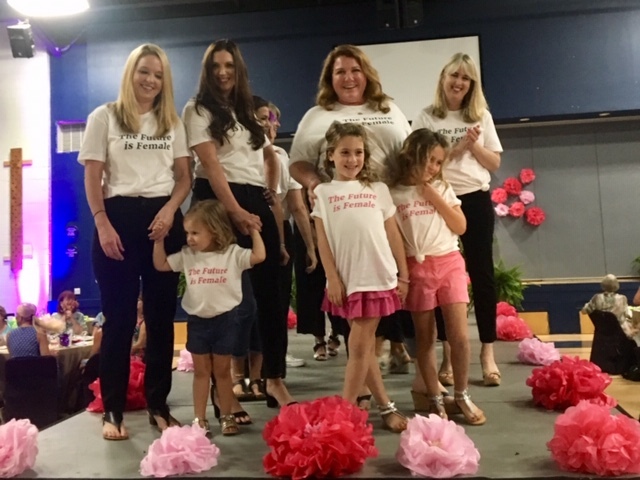 Center Stage took the fashion show itself with models wearing the latest fashion wear from Pine Ave boutiques Bella By The Sea and Pink&Navy. With the owners Jo-Ann Lefner and Amy Fleece being co-chairs of the event plus several models being owners along other Pine Ave business female success was very well presented. Darcie Duncan of Duncan Real Estate showed 3 different looks on the cat walk that also features beach hats and bags. Jo-Ann from Bella By The Sea stressed that not only bold colors like yellows are popular, also being comfortable makes jumpsuits, jogging style pants and wrinkle-free sundresses a favorite choice this season. Amy Fleece from Pink&Navy narrated her model styles that showed off cute swim style choices for the little ones as well as men beach wear. Live steel drum music accompanied the experience. The silent auctions featured several handmade bags and fun get togethers like a shopping party for 20 at Bella By The Sea or Pink&Navy, Wine and Cheese pairing lesson from Olive Oil Outpost, a luncheon hosted at the Shiny Fish Emporium and a makeover at a Salon. 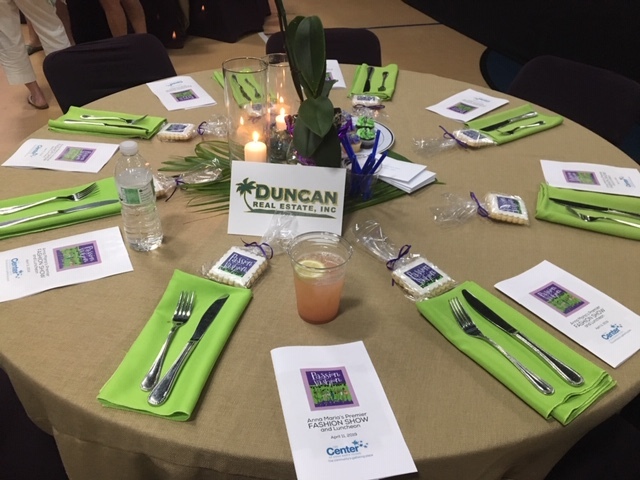 The beautiful orchid decor at the tables was also available for purchase to support the Center’s programs. Delicious cookies from the Pine Ave store “Hometown Dessert” were served as sweet endings of a great event. In addition each attendee received a swag bag of samples from several Pine Ave businesses. Have you seen all the funky, little vehicles on Anna Maria Island? But are they golf carts or LSV (light speed vehicles)? 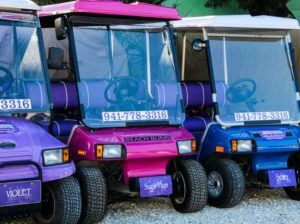 Traditional golf carts that are found on golf courses are really the minority of vehicles you see cruising on the island. They are not allowed on any street that has a 35 mph or higher speed limit including State Road 64 (Manatee Ave), State Road 789 (East Bay Drive), Gulf Drive (north of SR 64), Palm Drive, Marina Drive. However, they may cross the main streets but are also banned from sidewalks, bicycle paths and multi-use paths. 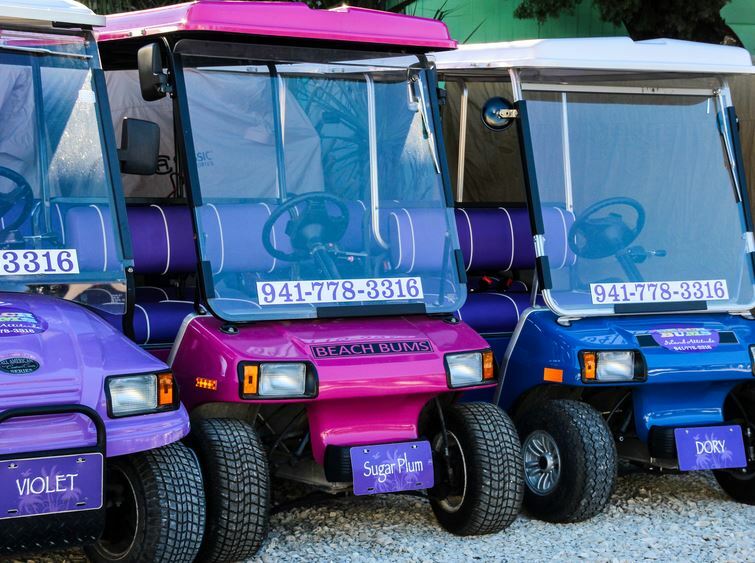 All of the traditional golf carts in the city of Holmes Beach are privately owned. They have in common with the popular LSV that they both need seat belts and must be operated by a licensed driver. Light speed vehicles travel at faster speeds and in addition need to be equipped with headlights, mirrors and a windscreen and have to be licensed and insured. 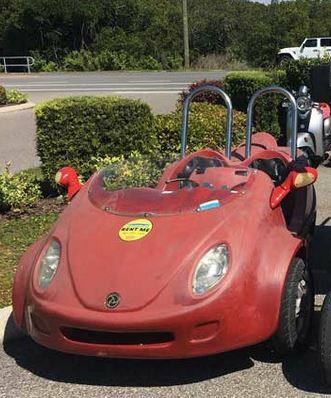 They are fully street legal. All rental places on the island offer this kind of transportation. They come in all shapes and colors and look like a lot of fun! If you are staying with Duncan Vacation Rentals take advantage of our Duncan V.I.P. Perks! The island shop “Beach Bums” offers a large, meticulously maintained, rental fleet of bikes, kayaks, paddle boards, surreys, beach supplies, electric golf carts, and electric bikes! Click here for their website. Enjoy 10% off any rental item with your Duncan guest promo code. Anna Maria Island supports an active lifestyle with inviting blue skies almost all year around. The beaches are great for relaxing but also good for exercising. Besides swimming in the Gulf of Mexico stroll at an easy pace and pick up shells on your way or power walk along the shores. You can watch people playing frisbee, beach ball, spike ball or a round of beach volleyball at the Manatee Public Beach. There is beach Yoga offered or bike along the multi use trail by Coquina Beach. Many homes and condo complexes offer community pools but how about tennis, anyone? 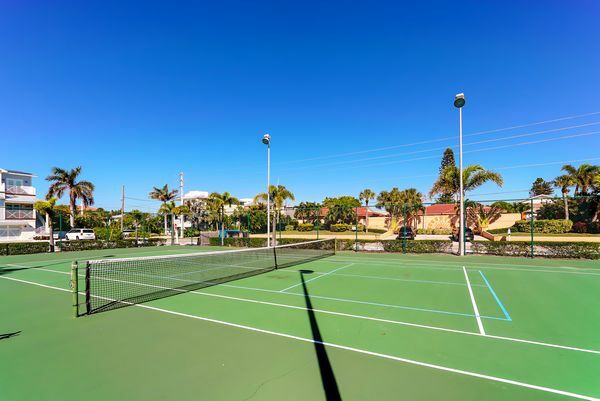 There are free public courts in Holmes Beach by 62nd St or try the hard courts at the Center on Magnolia Ave for a daily or longer membership cover. 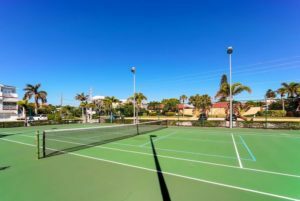 Even better is staying at one of Duncan Vacation Rentals condos that offer tennis courts or pickle ball as a great additional amenity. There are three complexes in total. With the beach steps away and the rest of Anna Maria Island easily accessible by car or trolley, you have no shortage of ways to enjoy your next Florida vacation in this Gulf front resort. The large pool is located between the two Water Edge buildings. You can swim in the heated pool and gaze out over the Gulf! There are loungers to soak up the sun. The tennis courts are just across the street. Stay at Water’s Edge 205 S or Water’s Edge 110 N and don’t forget your racket! Right next door is “Playa Encantada”. This supreme Anna Maria Island Gulf front complex offers direct access to one of the best beaches on the Florida West Coast. Elevator, heated pool and hot tub, meeting room and covered parking are some of the features amenities. 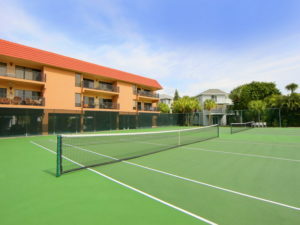 The tennis courts are across the street next to the rest of the condos on the East side of Gulf Drive. Book Playa Encantada 214 or Playa Encantada 116! The later one is for the tennis enthusiast and offers first row seating right! The Nautilus complex is a sought-after beach resort that has plenty to offer. Don’t miss any of the stunning sunsets that the island is famous for! Lounge around the pool area and meet new friends! Nautilus 104 and Nautilus 117 are ground level and have direct access to the heated community pool via a side door from the condo. Be active – walk the beach, take a swim or pick up the tennis racket. The tennis courts are located street side. 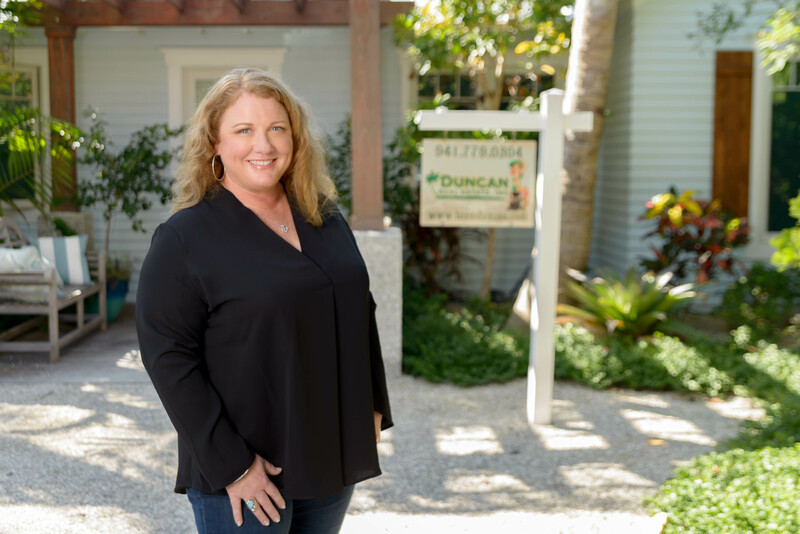 If you need more information on these Duncan Vacation Rentals on Anna Maria Island or others in our rental program please contact Team Duncan. You can contact us at 941 779 0304 or send us a quick message. Welcome to Gulf breezes and sunset views at Water’s Edge 205 S! 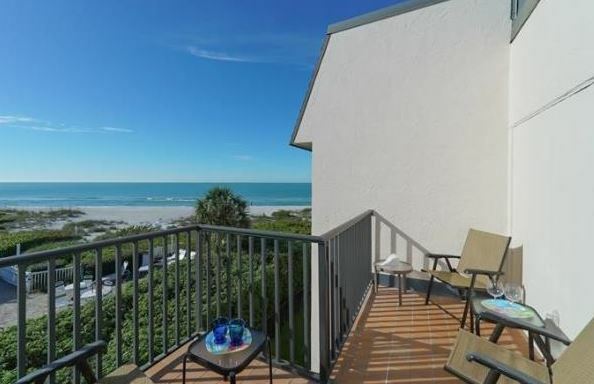 Experience the island like never before with this Gulf view condo! With the beach just steps away, you’ll love finding the perfect spot to take in some famous Florida sunshine along our seven mile shore. After a full day out, kick back in the shared heated pool or grab a seat on the balcony to watch the fun on the beach. Don’t miss a single spectacular sunset! Enter the South building of the Water Edge complex through a secured lobby and take the elevator up to the 2nd floor. An open living room with lots of light and the fabulous view will greet you. The condo features 1 bedroom with a king size bed , 1 1/2 bathroom with a shower/tub combo. It also offers a sleeper sofa in the den area, so there is plenty of room for 4 guests. The large heated pool is located between the two Water Edge buildings. You can swim in the heated pool and gaze out over the Gulf! There are loungers to soak up the sun. Tennis courts are across the street for your enjoyment. There’s parking for one car for those who would like to drive to their various excursions or relax and try the free trolley. One of the many stops is close by on Gulf Drive. Explore the island and meet locals on the bus! If you like more information about this wonderful island getaway call our Duncan Vacation Team for more information. We love to help you plan your next vacation! Please call 941 779 0304 or send us a quick message. Das offizielle Tourismusbüro von Florida “VISIT FLORIDA” bietet ein Online-Gewinnspiel in Verbindung mit seiner neuen Mietwagenrundreise “Florida Wild und Wundervoll” an. In Zusammenarbeit mit Spielzeughersteller Steiff und dem deutschen Reisekonzern FTI wurde ein neues Kuscheltier “Manati” speziell für diese Kampagne entworfen. 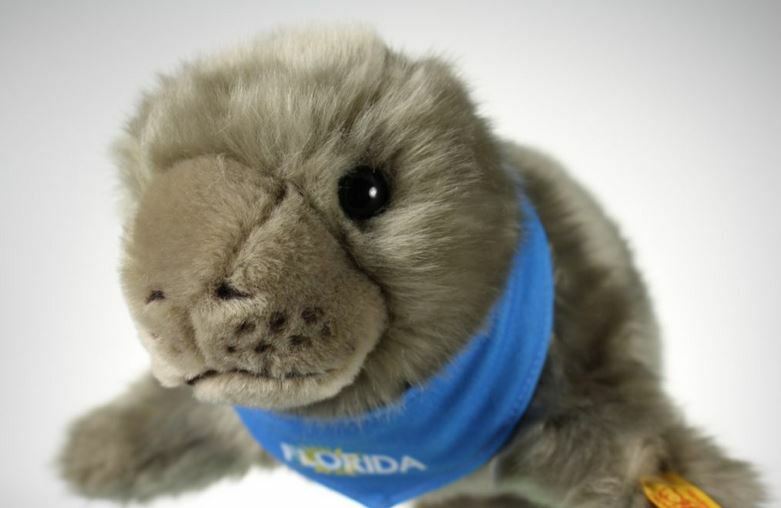 Das neue Modell sieht aus wie die Manatees oder Seekühe, die in den Gewässern um Florida beheimatet sind. Bis 31. Januar 2019 läuft ein Online-Gewinnspiel, um einen Namen für das Stofftier zu finden. Glückliche Gewinner erhalten eines von 100 Stofftieren oder besagte neue Mietwagenrundreise für 2 als Hauptgewinn. Welcher Name soll es sein? 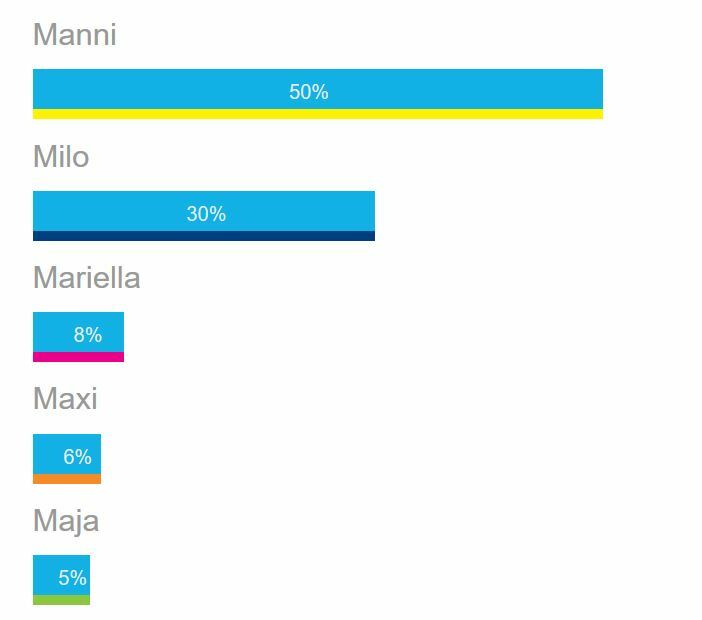 Versuchen Sie Ihr Glück mit “Gib unserem Manati einen Namen” oder gehen Sie am 1. und 2. Februar 2019 in den Pasing Arcaden in München auf Suche nach einem lebensgroßen Steiff Manati. Wer es findet, soll ein Foto per Facebook oder Instagram teilen. Am 4. und 5. Februar haben Sie nochmal eine Chance mit derselben Aktion am Hauptbahnhof Düsseldorf. Wer nicht unter den Gewinnern ist, kann trotzdem ein Manati kostenfrei ergattern. Bei Buchung dieses neuen Trips erhält man eines der Steiff als Geschenk. Zur Zeit liegt “Manni” in der Beliebtheitskala weit voraus. Viel Glück! Sollte Ihre Reiseplanung Anna Maria Island einschließen, kontaktieren Sie unser Ferienteam für kompetente Beratung. Duncan Real Estate bietet eine gefächerte Auswahl von Ferienobjekten direkt am Strand, in einer ruhigen Seitenstraße auf der Insel, mit Pool oder ein charmantes Cottage an. Einige Häuser befinden sich auf dem Festland in Bradenton. Unser Gäste- und Wartungsservice steht täglich zur Verfügung, damit Sie Ihren Urlaub unbeschwert genießen können. Wenn Not besteht, ist zu jeder Uhrzeit einer unserer Mitarbeiter zu erreichen. Sie können uns telefonisch unter 001 941 779 0304 erreichen oder einfach, gerne auch in deutsch per Email. Vacation time is always fun with the family and Duncan Real Estate can help you planning the perfect one! If you are thinking of a larger get-together or family reunion it might be a good idea to be close to each other but in separate accommodations. 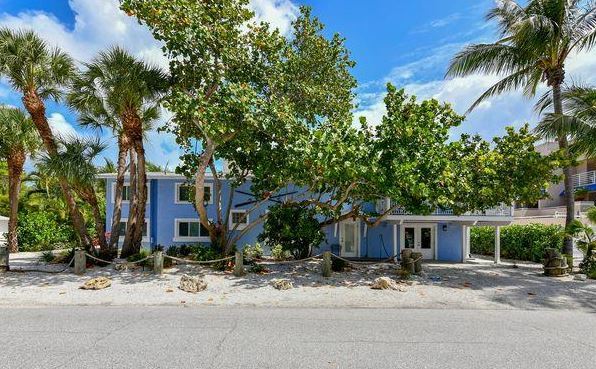 Check out our great duplexes and property combinations to spend time with your loved ones on Anna Maria Island and the beautiful beaches. This combination of three homes on Magnolia Avenue sleeps up 20 guests in 3 homes. All have a private pool and are within steps of each other. 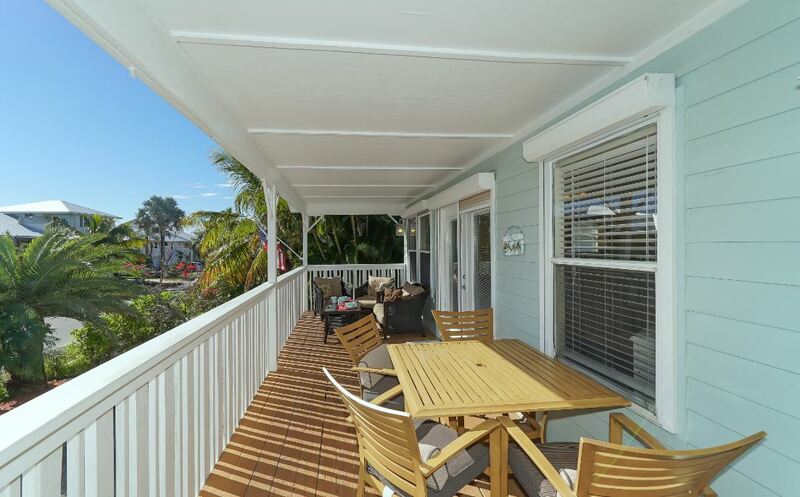 Enjoy a relaxing stay on quiet Magnolia Avenue on the North end of Anna Maria Island. The three homes are located in short walking distance to historic Pine Avenue with shops, small eateries and unique boutiques. The Anna Maria City Pier that was destroyed by Hurricane Irma will be reconstructed in 2019 and will be again a favorite hangout spot for the locals. Stroll down Magnolia Avenue to the beach access and soak up the sun on the wonderful beaches and breeze of the Gulf of Mexico. This duplex is a great family compound for 10 people and just steps to the beach! The nautical design and beautiful wooden floors are just the start to a wonderful island getaway. The downstairs features 3 bedrooms and a large loft that has a full bed to sleep 8. The smaller Sidekick has a separate side entrance on the first floor and sleeps 2 in a king size bed. Beach Walker 3 provides outdoor space with room to gather the family for a cookout. Rinse off the sand from your beach day in the outdoor shower. Relax in several sitting areas with the comfort of 7 TVs and free Internet. Washer and dryer are on site. The property is located in the heart of Holmes Beach and literally close to everything! This wonderfully remodeled duplex features a 2 bedroom downstairs and a one bedroom upstairs. Enjoy the tropical back area with large pool with spa and barbeque setup. You can sleep up to 6 people comfortably in beds. Surfer’s Paradise is just around the corner from the beach. This sounds like a great island getaway! Are you ready to plan your next island vacation? Please contact us our Duncan Vacation Team for more information! We love to find you the perfect place! Call us at 941 779 0304 or send us a quick message here. 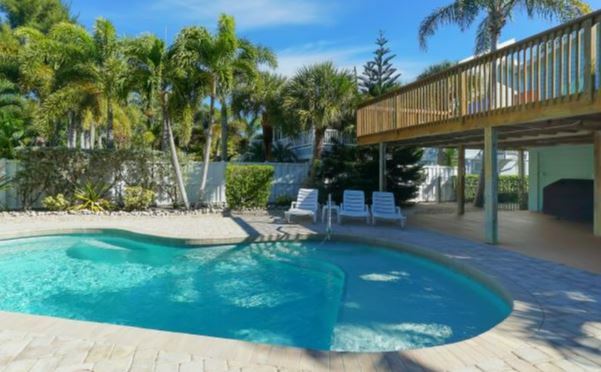 If you are still looking for a March getaway to Anna Maria Island relax at Canario Cottage! 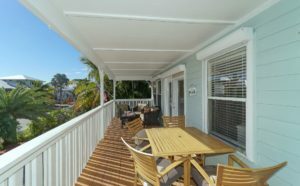 This lovely 3 bedroom vacation rental has 1254 square feet of elevated living space and offers 3 bathrooms to accommodate 6 guests very comfortably. Canario Cottage has plenty of sitting inside and out. Enjoy your morning coffee, lunch or dinner from the front porch overlooking palms and tropical foliage along quiet Magnolia Avenue. There is also a large porch at the back of the house with view of the sparkling pool and well kept back yard. Just move around with the sun! Or if you prefer shade after a long day at the beach take cover with one of the 4 provided sun chairs underneath the porch. Enjoy island life in this elevated home. Walk up the stairs to the living floor. The fully equipped kitchen has a great eating bar to accommodate 6 people. Relax at the comfy living area, pick your spot in the 3 bedrooms! There are 3 bathrooms and an outdoor shower by the pool. The best part is the location of this home! You are in the preferred North end area with everything in walking distance. Enjoy lovely vistas of Tampa Bay, stroll along Pine Avenue and browse the small eateries and boutiques. The beach access is at the end of Magnolia for a fun filled day at the beach. In the mood for some group acitivity? 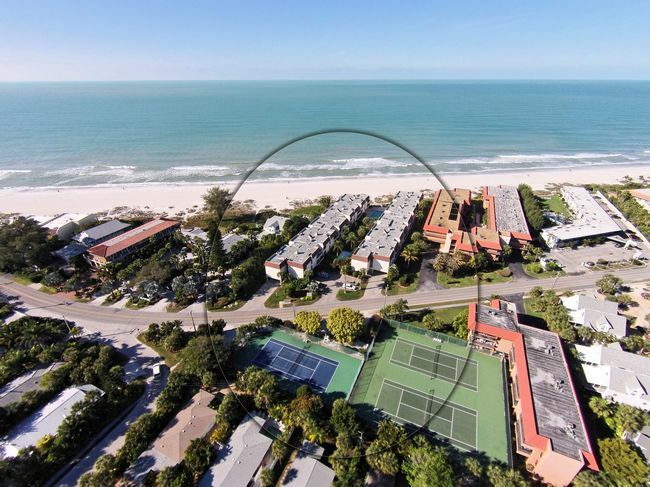 The Center of Anna Maria Island offers tennis, fitness and other classes and is also close by. Canario Cottage has lots to offer! Don’t miss out on this great vacation home and book your dates now! Team Duncan is looking forward to greeting you on our island paradise soon! 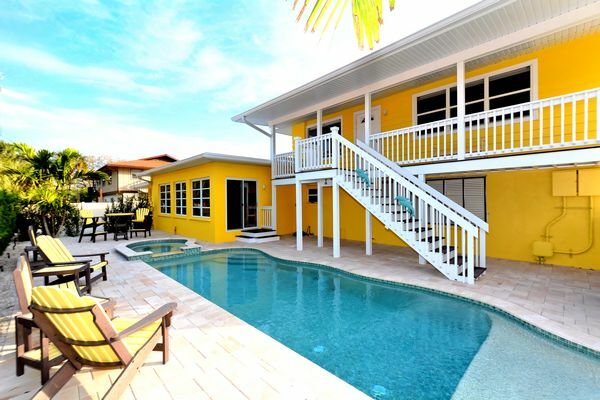 If you like more information about this home or other Duncan Vacation Rentals please contact our team at 941 779 0304 or send us a quick message here.